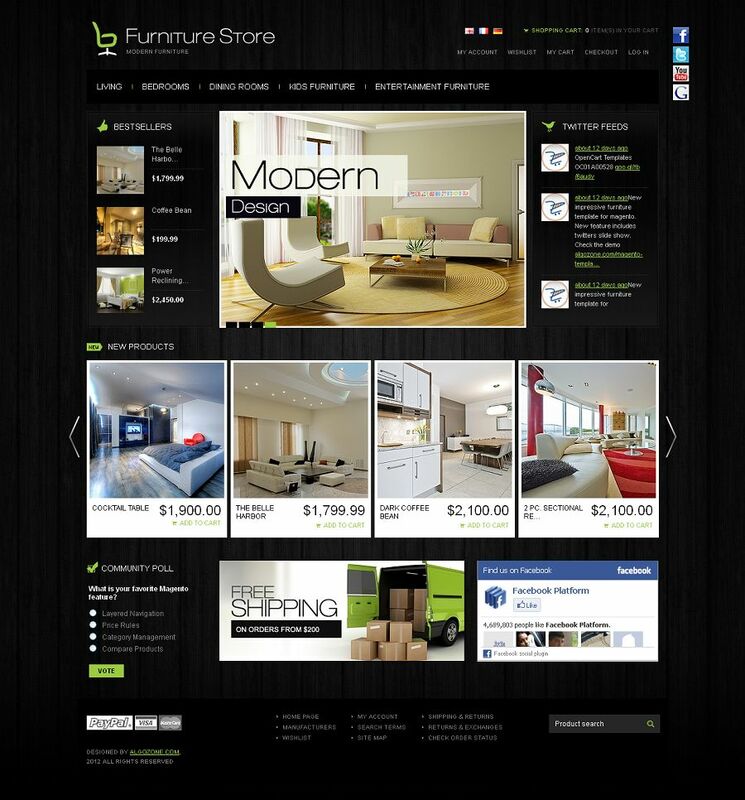 “Furniture Store” from Algoznone.com is a stylish template in a glossy black color scheme and is specially crafted as a premium template for furniture and home interior accessory stores. It comes with multiple homepage sliders, flexible design and layout schemes and a complexly customizable online storefront. The underlying Magento CMS allows you to easily set-up, manage and administer your site. The homepage has a prominent image slider for your featured images aligned with two vertical scrollers for your live Twitter stream and bestsellers. A second full-width mini slider just beneath the main slider can be used for your latest products. The template also allows you to include a user poll widget in the homepage, along with a Facebook “Like” box and embedded social media links. It also includes international flag icons for different language variations. You can also include a custom logo and can use the free blocks to include custom extensions or promotional banners. Navigation is by a primary multi-level header menu for all your product categories. Also included is a top-menu for basic account management links and article quicklinks in the footer. The template’s internal pages also come with a provision to add sub-category menu in the sidebar where you can add custom options such as “Price Range”, color, brand, manufacturer etc. Users can also choose from a grid or list display option and sort listings with multiple attributes. The template also includes a breadcrumb trail for internal pages so that users can easily get to know their internal page location. Individual product pages come with a magnification scroller for the product image. You can also add multiple images which would show as a gallery in a separate tab. The product description block comes with a table format for your options and design specifications. Also included are social media icons by which users can directly share the product. Registered users can post reviews, submit product tags, compare between multiple products and create a wishlist of products. They would also have a individual dashboard which lists all their profile and activity information. The template comes with included PSD files and requires Magento version 1.7 and higher. It’s compatible with major browsers and also includes an handy installation guide. The “Furniture Store” template is priced at $79.